Regenerative technology increases efficiency of KONE elevator. Prominent and beautiful stairway encourages stair use. 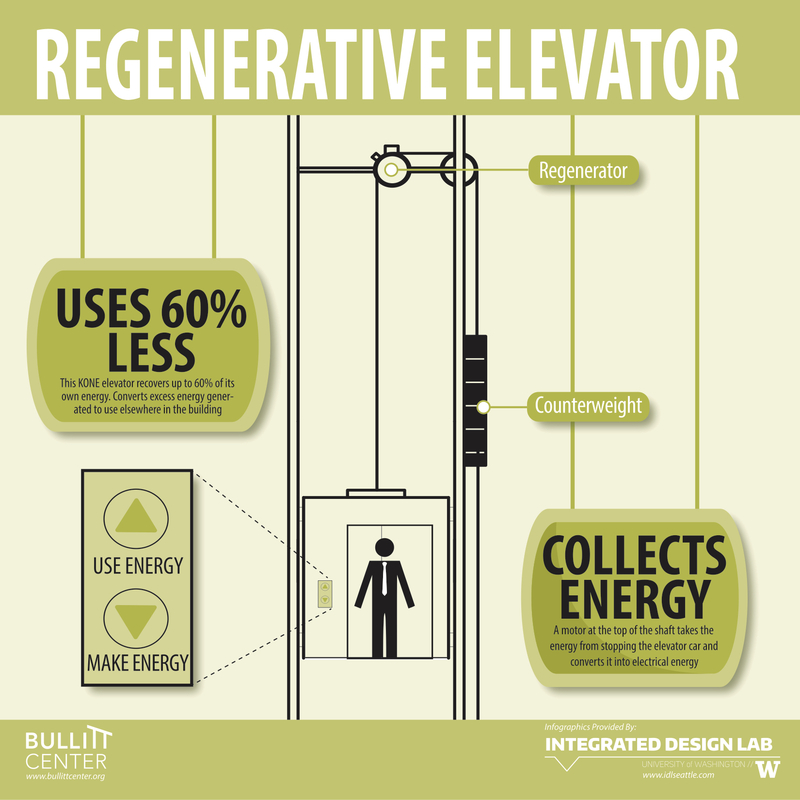 Fully ADA-compliant elevator uses “Regenerator” to convert kinetic energy from braking into useable electricity, saving 60% of typical electrical use. One of the most prized design elements of the Bullitt Center is the great glass-enclosed stairs, fondly dubbed the ‘Irresistible Stairway.’ For people who are able to use stairs, it is designed to draw people upward as the primary means of vertical circulation in the building. Just beyond the stairway is a modern elevator that is fully compliant with the Americans with Disabilities Act. And while the stairway was designed to minimize elevator use and maximize energy efficiency, the elevator is a bit of a technological marvel in its own right. 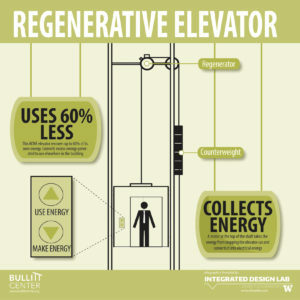 Designed by engineers at KONE, the elevator works much in the same way as a Prius – with a regenerative mechanism to capture energy as the elevator slows down. A motor at the top of the shaft takes the energy from stopping the elevator car and converts it into electrical energy, which can then be used elsewhere in the building. The Elevator is said to be about 60% more efficient than standard elevators and careful placement that discourages its use only adds to this efficiency multiplier.